Pulse arc welding uses short pulses to keep the average current low during welding. You get clean welds with much lower heat input. Lower splattering and more control over welds provides a great option for many applications requiring precision welds. Advanced Integrated Technologies ( AIT ) is a welding equipment and technical support provider for Sunstone brand Pulse Arc Welders. We can evaluate your product samples, provide free test welds, and accurately specify which equipment is best for your application. We can then provide the equipment you need at an economical price, and assist with any technical issues you encounter setting up your welding process. Submit a contact form or call us today to request assistance with your next project. Sunstone's Orion PA230 is a pulse arc welder utilizing 230 joules as well as a resitance spot welder using capacitative discharge technology. The PA230 has 3 different weld modes that can be changed at the push of a button and weld energy adjusted to suit the application. This model is suited for a variety of metals and applications, even more exotic metals such as gold and finds good applications in the medical industry and laboritories, given it's versatility. 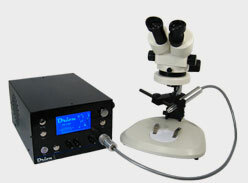 Power Supply (L x W x H) 13" x 10" x 6.5"
Microscope (L x W x H) 12" x 11.5" x 15.5"
The Orion Pulse 150i features newly developed Intelligent Welding TM technology, which automatically adjusts weld settings for any metal or application. Experiencing interactive touch screen navigation, high-frequency agitation for difficult metals like palladium, adaptive weld ignition for longer electrode life, and a new multi-pulse setting for laser like welding, the user has a friendly and easy work flow. The Pulse 150i continues the Orion legacy by providing the most high-tech, versatile, and affordable welding solution on the market today. As with other Orion welders, the Orion Pulse 150i utilizes two different welding technologies – Pulse Arc and Tack. The Tack Mode uses resistance welding technology with up to 150 watt-seconds of energy. The Tack Mode is perfect for temporary placement or permanent fusion welding. The Pulse Arc Mode uses pulse-arc welding technology and consists of three distinct energy ranges – Ultra, Micro, and Nano. The Ultra energy range uses up to 150 joules of energy for projects that require deeper penetration or a larger spot size. The Micro energy range uses up to 30 joules of energy and is perfect for moderate penetration and more delicate pieces. The Nano energy range is a new weld setting that offers precise weld energy control from 0.5 – 5 joules of energy, perfect for very fine applications. The Orion Pulse 200i and 250i have a variety of some of the most advanced micro-arc welding features available. The 200i and 250i utilize Intelligent Welding technology that streamilines the welding process by automatically adjusting settings based on metal and application. The user will have the added benefit of touch-screen navigation, multi-pulse settings for more precise welds, and high-frequency agitation for the tough jobs and metals. The Orion Pulse Series utilizes four different energy modes: Ultra, Micro, Nano, and Tack. The highest energy range, Ultra, uses up to 200 joules of energy for the Orion Pulse 200i and 250 for the Orion Pulse 250i for tougher projects that require a larger spot size and higher depth of penetration. The medium energy range, Micro, uses up to 20 joules of energy and is perfect for moderate penetration and more delicate pieces. The lowest energy range, Nano, is a weld setting that uses the precise engery between 0.5-5 joules, for the finest welds. The Tack Mode is a resistance welding mode that uses up to 200 joules of energy for the Orion Pulse 200i and 250 for the Orion Pulse 250i, for temporary placement welds or permanent fusion welding. Orion EV Copper Welding System. 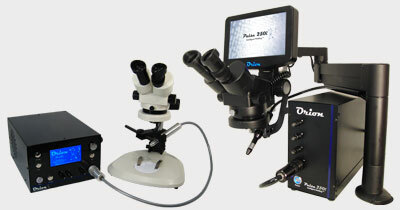 Includes Arm Microscope, Modified WH1125A , Industrial Orion Stylus and Roll of SC500N10 Copper, paired with an EV welder. The Orion 200i2 is packed with features that will simplify the welding process. Innovative features include – the new Pico weld mode for intricate welds utilizing weld energy as low as 0.01 Joules, to achieve truly microscopic weld joints; user selectable up to 200 joules of energy for large work-pieces; a large 10” touch screen interface with one-touch access to all welding parameters; the ultimate space saving design; and 3 unique pulse shape wave form options to choose from: Classic Orion (for Orion users that have come to love welds produced by the Orion 150i), Triangle, and Square. In addition, we introduce Seam mode—a revolutionary breakthrough in micro pulse arc welding. Seam mode allows users to mimic laser welding with weld speeds up to 30 welds/sec. Keeping in the Orion tradition of excellent customer service, training, and support we have added on-screen resources, which include video tutorials and the product user manual. The patent pending Orion 200i2 gives you the precision of a laser with the versatility, power, and ease of a pulse arc welder. Footprint L x W x H - 4” x 5” x 27” (10 x 12.5x 68.5cm)"
The Orion 250i2 is packed with features that will simplify the welding process. Innovative features include – the new Pico weld mode for intricate welds utilizing weld energy as low as 0.01 Joules, to achieve truly microscopic weld joints; user selectable up to 250 joules of energy for large work-pieces; a large 10” touch screen interface with one-touch access to all welding parameters; the ultimate space saving design; and 3 unique pulse shape wave form options to choose from: Classic Orion (for Orion users that have come to love welds produced by the Orion 150i), Triangle, and Square. In addition, we introduce Seam mode—a revolutionary breakthrough in micro pulse arc welding. Seam mode allows users to mimic laser welding with weld speeds up to 30 welds/sec. Keeping in the Orion tradition of excellent customer service, training, and support we have added on-screen resources, which include video tutorials and the product user manual. The patent pending Orion 250i2 gives you the precision of a laser with the versatility, power, and ease of a pulse arc welder. The Orion 150s features a large touch screen interface that streamlines and simplifies the welding process – allowing users to do more and to work more efficiently. Users have many features available to them including high-frequency agitation for added penetration and weld strength, adaptive weld ignition for longer electrode life, customizable save settings for fast and easy switching between weld settings, fully updateable and upgradeable software options, and so much more. The Orion 150s continues the Orion legacy by providing the most high-tech, versatile, and affordable welding solution on the market today. As with other Orion welders, the Orion 150s utilizes two different welding technologies – Pulse Arc and Tack. The Tack Mode uses resistance welding technology with up to 150 watt-seconds of energy. The Tack Mode is perfect for temporary placement or permanent fusion welding. The Pulse Arc Mode uses pulse-arc welding technology and consists of two distinct energy ranges – Micro and Ultra. The Ultra energy range uses up to 150 joules of energy for projects that require deeper penetration or a larger spot size. The Micro energy range uses up to 30 joules of energy and is perfect for smaller and more delicate pieces. The Orion 150s offers a versatile, compact, and affordable welding system in an easy-to-use package. The Orion Pulse 250s is a powerful addition to the Orion line of pulse-arc welding technology. Like all Orion welders, the Orion 250s features a large touch screen interface that streamlines and simplifies the welding process – allowing users to do more and to work more efficiently. Users have many features available to them including high-frequency agitation for added penetration and weld strength, adaptive weld ignition for longer electrode life, customizable save settings for fast and easy switching between weld settings, fully updateable and upgradeable software options, and so much more. The Orion 250s continues the Orion legacy by providing the most high-tech, versatile, and affordable welding solution on the market today. As with other Orion welders, the Orion 250s utilizes two different welding technologies – Pulse Arc and Tack. The Tack Mode uses resistance welding technology with up to 250 watt-seconds of energy. The Tack Mode is perfect for temporary placement or permanent fusion welding. The Pulse Arc Mode uses pulse-arc welding technology and consists of two distinct energy ranges – Micro and Ultra. The Ultra energy range uses up to 250 joules of energy for projects that require deeper penetration or a larger spot size. The Micro energy range uses up to 30 joules of energy and is perfect for smaller and more delicate pieces. The Orion 250s offers a versatile, compact, and affordable welding system in an easy-to-use package. 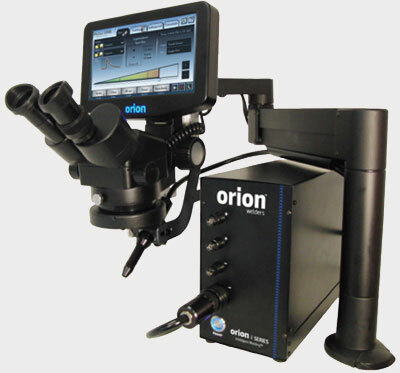 The Orion 100c is the compact, entry-level Orion welder, and was designed and developed to meet the needs of the market – smaller footprint to save space, easy-to-use touch screen interface for quick access and adjustments of welding parameters, high-frequency agitation options for difficult to weld metals, and all this at a low initial cost. The Orion 100c continues the Orion legacy by providing the most high-tech, versatile, and affordable welding solution on the market today. The Orion 100c is a powerful addition to the Orion line of pulse-arc welding technology. Like all Orion welders, the Orion 100c features a touch screen interface that streamlines and simplifies the welding process – allowing users to do more and to work more efficiently. Users have many features available to them including high-frequency agitation for added penetration and weld strength, precise weld ignition for clean welds and long electrode life, customizable save settings for fast and easy switching between weld settings, and fully updateable and upgradeable software options. As with other Orion welders, the Orion 100c utilizes two different welding technologies – Pulse Arc and Tack. The Tack Mode uses resistance welding technology with up to 100 watt-seconds of energy. The Tack Mode is perfect for temporary placement or permanent fusion welding. Pulse-Arc Welding technology consists of two distinct energy ranges – Micro and Ultra. The Ultra energy range is between 30 and 100 joules of energy for projects that require deeper penetration or a larger spot size. The Micro energym range is between 3 and 29 joules of energy and is perfect for smaller and more delicate pieces. The Orion 100c offers a versatile, compact, and affordable welding system in an easy-to-use package. The Orion mPulse 30 is a small and friendly welder that is easy to use and offers great versatility. Packing a has a 30ws power potential, it’s great for small quick welds on a light duty cycle. There are 11 different power settings to choose from ranging from 5.0ws to 30ws, in 2.5ws increments. The smallest weld spot size is nearly 1mm, depending upon your material. The largest setting of 30ws will yield a weld spot approximately 1.5mm in diameter, also depending on material. The mPulse 30 works amazingly well with Titanium, Steel, Gold, Silver and many other metals used in a wide range of industries. It’s a superior alternative to any solder application; and, measuring in at 5.5” x 5.25” x 3.625”, the mPulse 30 is small and out of the way. Research and developement with a PhD team of engineers has allowed something this small to be as versatile and powerful as a larger machine. The robust industrial grade gas regulator ensures accurate control of shielding argon gas used in many welding applications. When joined with Sunstone Engineering and Orion Welders products, the regulator’s precision allows for superior welding results. It features high-precision for low flow argon control from 1 to 30 psi, with unlimited adjustments in between.